I have been diagnosed with insertional Achilles calcification in my left ankle. X-rays showed a pretty large buildup, which was actually the cause of a very visible bump on my ankle. 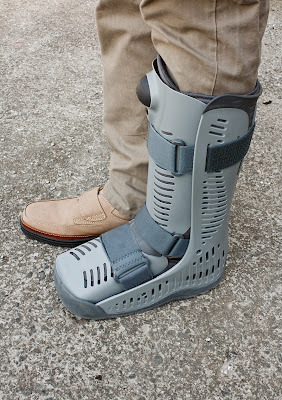 I stopped all activity for 30 days and wore an elevated shoe, to avoid the boot. It helped but the pain is definitely less frequent but still there. I can’t get back to all of my regular activities I had enjoyed, like running or just horsing around with my son. Any period of activity of more than a couple minutes results in pain a couple hours later. My ortho has suggested a boot for 30 days and if that doesn’t work, surgery. I read one of your earlier responses that icing down the area immediately after a workout is a good thing. Could I create more of an issue trying this and reincorporating activity or should I keep chasing a fix? My trainer saw the x-ray and agrees that it’s large enough to where it’s not going to go away. Dr. Blake's Response: I have always taken the approach that pain from a bone spur is suspect since the bone spur has been there for a long time, so why is it just now hurting. I know that there is more to your story so I will add it on if you reply. When the "S" word is used, my deep-seated gut is looking for ways out. You have to take out the bone spurs, and really just think of Achilles tendinitis at its insertion. How do we treat general tendinitis? The mnemonic is BRISS: Biomechanics, Rest, Ice, Stretch and Strengthen. The Achilles is now your weak spot that you have to make stronger. Maybe that will ultimately require surgery, but maybe not. The Biomechanics that help is a plantarflexed or pointed foot. This is why an elevated heel helped. Women have the advantage here by hanging out longer in wedges and heels and avoid flat foot. You must also take that rule and apply to stretching--only stretch to the ankle at a right angle, not negative heel, where the heel drops below the front of your foot. Strengthening you want to work the range first of your heel on a 1-inch lift and go up and down from there, not lower. The Rest is for Activity Modification. It normally takes 9 months to completely rehab an Achilles tendon. You are in month 2. The first few months are the Immobilization/Anti-Inflammatory to create a 0-2 pain level. The next Phase is Restrengthening. The final Phase is Return to Activity. You can not jump to Return to Activity now, that is reasonable. What we need in the good Physio approach to the restrengthening and gradual increase in activities. The Ice is anything that helps us reduce the inflammatory. Ice pack 2-3 times a day for 10 minutes is good. If there is a lot of swelling, then contrast bathing. You can use oral meds for 5-10 day bursts of the full dose, and then 2-4 days off to rest your system. Physical therapy and acupuncture are wonderful at reducing the inflammation, increasing blood flow, and PTs can give you exercise advise. The First "S" is Stretch. For any Achilles problem way down at the heel, the best stretch is the plantar fascial wall stretch. The second best is the soleus bent knee Achilles stretch. PTs have some heel. But, since stretching the Achilles in some cases is painful, you must consider only during deep calf massage to loosen its force on the heel. The Second "S" is Strengthen. This is crucial for the achilles. Even relatively strong athletes can improve their strength 30-50% where it can help symptoms. Here is where range of motion comes in. You only want to strengthen the tendon from an ankle neutral to ankle plantar flexed position. Try to stay away from an ankle dorsiflexed position to start the strength work, like starting a heel raise from a deep squat or where the heel is dropped off the step. I appreciate the response. This started early 2017, which had coincided with me picking up running after taking a break for several years. I was able to start doing 4-5 runs a week, typically on a treadmill, for 3-4 miles each time. I started noticing that my ankles would get very stiff several hours after running. I then started waking up with soreness but once I was moving around or running, the pain would wear off eventually, usually after pushing through. It early in 2017 though, it got to the point where the pain was constant and would last for days at a time. I am in Texas and a fan of cowboy boots and I noticed that wearing them seemed to help. After consulting with an orthopedic surgeon, it was determined that I had calcification at the Achilles. That is essentially where I currently am at. I will say that at this point, when I do have pain I can sometimes manipulate my ankle by twisting it around until it feels like it pops and that provides instant relief. I have avoided running but have replaced it with long walks and about 50% of the time I will have pain while other times it is totally fine. Basketball, tennis, anything with sudden side to side movement is out mainly due to the fear of pain from a couple of times I have tried it. Dr. Blake's comment: This is extremely interesting, and it is good the pain is not constant. The fact that you can release pressure, means that the ankle joint is more involved. That sign of popping and feeling better is a joint symptom. I am hopeful you do not rush into surgery and give this proper time. Hopefully, some imaging can be sent here. See the blog post on WeTransfer. I would love to see a good MRI to look at the Achilles, spurs, and ankle joint. Good luck! I hope this message finds you well. Thanks for the blog--it’s a great resource, I've been learning a lot from it, and I appreciate your therapeutic approach. The short version: pain in the area of the right foot MTP joints on the underside of the foot, associated with activity, pretty well under control for now but worried about increasing activity levels in general and hills in particular. The long version: healthy, active, 25yo male, lifted regularly, walked lots, went for backpacking trips with a heavy pack with no trouble for years, worked part-time in a commercial kitchen, etc. Tried to take up boxing in the summer of 2016, got some small but stubborn tibial stress fractures from skipping rope on concrete, took a lot of time off but gradually resumed activity (lifting, walking, dancing) with no trouble. Incurred some very small fractures in the left metatarsals in a motorcycle accident in March 2017, healed fully, resumed activity. A little pain in the left foot from time to time, but nothing that worried me. After a couple of brisk hikes in late June/early July, I noticed some unusual pain in about the 3rd-5th MTP joints of the right foot, on the underside of the foot. Not tender to the touch, but a kind of dull throbbing on and off throughout the day. I thought it might be just part of the adaptation process--it had been a while since I had done any serious walking, what with coming back from the broken foot. And I had a short-term job that required a fair bit of loaded hiking (forestry), so I pretty much plowed ahead. The foot didn’t get any better, but it didn’t get dramatically worse, either; I was in stout, supportive boots (albeit possibly too narrow and with too high a heel, see below) during the day, and I noticed some pain when I took them off at night, but nothing crippling. Still, I figured some time off would do me good, so after the job wrapped up in September I stayed away from running and hiking for a couple of months. The foot calmed down but wasn’t quite back to normal after six weeks off. Pain during everyday life was essentially zero, but eccentric calf raises with the forefoot on a block caused a lot more pain in the right forefoot than I would normally expect, so I saw a primary care doctor who ordered x-rays (attached--let me know if the attachment doesn't work) and referred me to a podiatrist. The podiatrist diagnosed hallux limitus in the right foot--there was a lot of talk about “degenerative,” “never gets better”, “have you tried swimming, it’s great cardio,” etc. I didn’t care for the sound of this, not wanting to go back to working at a desk, and the podiatrist didn’t strike me as the most competent. So I sought a second opinion from a local AAPSM/ACFAS guy who had a fair bit of running experience (former D1 distance runner). I also began a walking/jogging progression, very conservatively, while avoiding anything I knew aggravated the foot. In particular, I noticed that time on the stairmill and on a steeply inclined treadmill seemed to cause pain out of proportion to impact, and forefoot striking when I ran also made things noticeably worse. The second podiatrist said that hallux ROM was fine, he didn’t see any swelling, no tenderness to the touch, and encouraged me to experiment with shoes and over-the-counter orthotics and running surfaces and to stop walking around the house barefoot. He didn’t see anything unusual or alarming about my gait, and noted that my feet were a bit flat but not necessarily in need of an orthotic. His diagnosis was “metatarsalgia, like a bruise--not a stress fracture”. This was in about the first week of December. Dr Blake's comment: This is why I love the AAPSM. Right or wrong, good overall approach. Sounds like nerve to me, and I am glad you had no Hallux limitus. Did he check your achilles for tightness? This is a big reason why patients get metatarsalgia. You work on the 3 causes of pain: mechanical, inflammatory and neuropathic. Mechanical is dropping the heel height, stretch the Achilles tendon, and Hapad longitudinal Metatarsal Arch Pad Small just behind the soreness. Inflammatory with icing or warm water soaks (have to see what feels better). Neuropathic with pain-free massage, Neuro-Eze gel, Neural Flossing three times a day. These at least for what we know now. I ended up in the Altra Olympus, very happy with them for walking and running, and somewhat happy with Altra’s desert boots for casual wear. (I tried Hokas, but even their wide sizes were a touch narrow in the forefoot for me.). A felt metatarsal pad on the stock insole (for both feet) also helped a good deal. I found that easy running on grass with a heel strike and a high cadence didn’t seem to make things any worse, and got a pair of cushioned flip-flops for walking around the house. Dr. Blake's comment: You are doing everything right. For those that do not know Altra shoes, they are all zero drop, meaning no heel lift to put pressure on the front of your foot. I love the big Hapads to spread the force. You may have to thin out. The small size is usually perfect. Since then, I’ve been titrating up the jogging, taking it easy and staying on grass, adding 5 minutes here and an extra session there, and I still seem to tolerate it pretty well, so that’s all to the good. I’m down about 5 pounds from 200 in December to 195 now and plan to drop another 5-10 in the coming months, which should also help. I’ve been supplementing D3 and K2 for years and have continued to do so, along with milk, yogurt, and a calcium/magnesium supplement. I've also been lifting and it doesn't seem to cause any pain. Two things have given me cause for concern. Dr. Blake's comment: The problem was the new unbroken-into shoe, and a more then what you were used to hiking. It sounds reasonable it should have flared up with the shoe was not flexible enough at that moment allowing more stress to the tissue. Glad it calmed down. The second was a few days ago when I tried to stretch my calves by standing on a block with my heel hanging off and letting the heel drop. Felt fine at the time, but about three hours later, I noticed a dull throbbing pain from the right 3rd-5th MTP joints, which came and went periodically for the next 24 hours or so. I’ve been icing for 10 minutes 1-2x/day for the last few days as per your blog--too soon to tell whether it makes a long-term difference, but it sure seems to help acutely. I'm also going to start contrast therapy. Again, the pain was pretty much back to normal (so, a little “sensitive” or “tender” but essentially zero real, consistent pain with everyday activity and jogging on grass) within about three days. Dr. Blake's comment: This is called placing your foot in a negative heel position and all the weight on the forefoot. Another unusual stress that irritated things. These are benchmarks for what you can and can not do this month. Typically they are not permanent in any way, but you are not ready for that for the next 3 months. Then you can test it again. Were you doing it single leg or double? Less stress with double. Anyway, what these two incidents (together with my earlier experiences with the stairmill and inclined treadmill) suggest to me is that even though I can run a bit on the flat, hills may be a problem. But I’d like to work in forestry again this summer, and walking up hills is a pretty central job requirement. And it’s been six months now, including two months more or less completely off--seems like a long time for this not to heal, given the circumstances. Dr. Blake's comment: Please experiment when you are doing at risk things only either the double loop Budin splint (loops on the 2nd and 4th toes) and a carbon graphite plate under the insert you are wearing. These are only for the times you feel you should have the extra protection. So: any recommendations for reintroducing hills? Any suggestions for thinking about how much heel my work boots should have, other than trying various different things and seeing what’s comfortable? (For reference: high heel like what I wore last season, lower heel.). Anything I should be thinking about that I’m not? Anything I shouldn’t be thinking about that I am? Should I worry more, less, or exactly as much as I am that this is the first inkling of a degenerative condition that will lock me into a desk job forever, or at least for next season? I think that’s about everything I wanted to ask, together with all the relevant information. If there’s anything else that would help you give an informed answer, feel free to ask. Thanks for reading, and thank you for your time. I have been corresponding with this patient over injury to the sesamoids. Here are some of our recent conversations. The patient's response: Wow, that is a lot of problems with my foot. Not good at all. Thank you so much for taking the time to review my MRI. As I suspected, my local doctor told me today that after reviewing my MRI, he wants to put me in a cast 4-6 weeks, preferably go on disability, he fears a possibility of Avascular Necrosis in the sesamoid bones. He even mentioned a steroid shot! Aggh. After the 6 weeks of casting, I should heal then begin retraining my foot to walk. If all fails he wants to remove the sesamoid bones. Aggh. What a way to start the new year. I wish you had a local office nearby. Lol. I asked if PT could help, he said it would just make inflammation worse. Hi Dr. Richard Blake, just an update. So today I got my cast put on. I took 2 months off work, and I'm doing my best to stay off my foot 100%. I'm using a knee scooter to get around the house and using crutches to move outside the house. I've been offloading all the weight of my right foot that now my left foot is aching near the same spot in the ball of the foot of my left foot what a bummer. So I still want to get the device you recommend, Exogen 4000. But my doctor says it's to expensive and that it cost thousands of dollars and that my insurance won't cover it. He's right, my insurance won't cover it, so I'm still looking around. I found one on eBay used, does this look like the device? If it is I'm willing to buy it out of pocket. But my question is, could I use this with a cast on? Is this the one you recommend? Doctor, from your personal and professional opinion, do you believe the 6 weeks of cast should fix my issues? I'm really scared of not being able to do any sport activities again like running and hiking. I just had my first daughter 6 months ago and I really want to be able to do sport activities with her. I'm afraid of the 50/50 possibilities my current doctor is giving me. He says there is a 50/50 chance the cast does not work and we need to do surgery. I asked him if he believes if this should work and he says according to all the literature, it's the best approach. I'm afraid he has no actual experience with this sesamoid issue. It's so hard to find a doctor that knows how to treat this. I feel like a guinea pig with my doctor. Sorry for my rant and for bothering you, but I'm at a lost right now. I truly do appreciate you taking your time to even read my emails. Dr Blake's response: Any of the Exogen 4000 units should work. You are getting it to start a one year process of healing, with the 6 weeks of casting just the start. You should be at a 0-2 pain level and you then advance to a removable cast weight bearing for 2-4 more months still keeping the 0-2 levels. The bone stim should lay on the top of the big toe joint twice daily for 20 minutes so the cast would have to be opened up by the doc or you wait until the cast comes off. 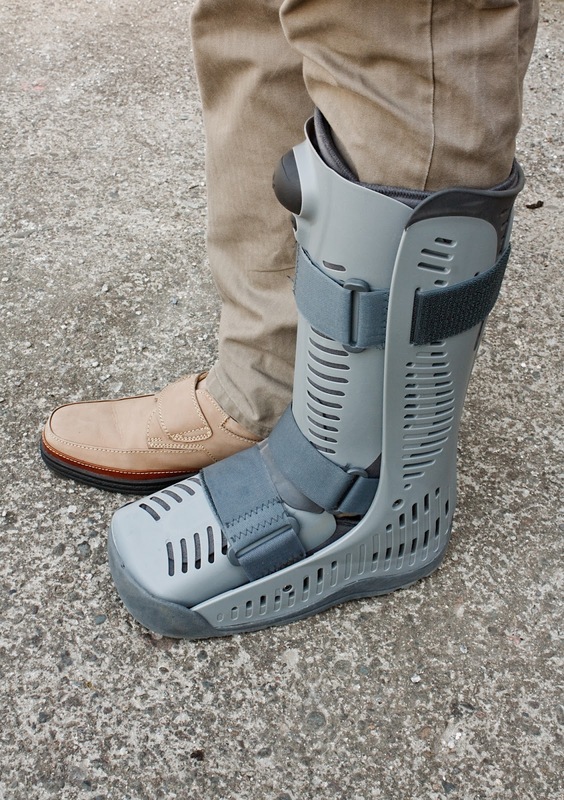 See all the advice in this blog on the treatment post-boot. Rich Good luck!! I hope I am never too old to keep learning. This wonderful video on plantar fascia presents 4 stretches for plantar fasciitis sufferers. The first two for the gastrocnemius and soleus are common, but he discusses a variant of my plantar wall stretch and introduces the importance of stretching the anterior tibial tendon. I have included my video below James Dunn's video for your comparison. Thank you, James. I can not wait to try these versions and get my patients feedback. It is how we learn. My name is Francine (name changed due to witness protection) and I'm 45 years old. I came across to your youtube video of the talk you gave at the SF Main library, after going to see a podiatrist a few weeks ago. Coincidentally, the lady who arranges the library lectures is an acquaintance of mine who lives in the same complex as my mom, who later, after I mentioned of my chronic severe back and feet problems, recommended your office. I was very excited to have seen your youtube video. I feel the compassion you have for your patients and ppl living with unnecessary pain. I thank you and whoever videotaped that video and to put it out there so many ppl can be helped. I have had chronic back and feet problems probably for at least 20 years. Started with rounded shoulders (possibly bad posture and the heavy backpacks back in the day). I have seen probably a few massage therapists, PT, chiropractors (upon recommendation) to little relief. About 6-7 years ago I knew my feet hurt (the outer edge as I walk excessively on the outer heel and edge of my feet, as seen by the many pairs of excessive worn out heels from shoes. at the time (6-7 years ago I'm estimating the time frame) I saw a podiatrist at Cal Pacific (had to yelp for podiatrists in order to jolt my memory) and at the time he had made a custom-made orthotics for me. I was very persistent in using it for about a month but it was very uncomfortable so I stopped. I never went to follow up with him. I recall he boasted about working with celebrities and I vaguely recall he mentioned I have the typical Asian "flat feet". Dr. Blake's comment: You describe excessive supination or being on the outside of your feet. Do you think you know if these orthotic devices helped that? Do you remember what bothered you about them? If you still have them, putting back in your shoes for several days may help you remember the pros and cons. 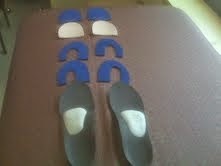 If you were to get new orthotic devices, you do not want to repeat the same, you want to improve on it. I started hiking/walking/swimming about 3-4 years ago (but was pretty much led a sedentary lifestyle growing up) as I gained 25 lbs over the past 6-8 years ago, suffering tremendously from some women's health issues that plagued me most of my adult life. After 2 major surgeries to deal with the issues (almost 8 & 3 years ago), I began to deal with the chronic back issues. I would get severe migraines due to the hard rock stiffness and tightness of my delts, rhomboids, shoulder/neck areas and since then began going to a chiro, PTs that were referred to me, of very little relief temporarily and nil permanently. and then finding my own massage therapist (who has tremendously helped me). A year ago I went to a podiatrist at Mills Hospital as an episode hiking in the park (moderate, not even strenuous by standards) left my foot debilitated. The outer edge of feet was in sooo much pain/ discomfort I had to YANK OFF MY BOOTS during our lunch break for the foot to breathe for 15-20m. After lunch was over, we had to return to the cars. Thankfully this was all DOWNHILL. I limped the rest of the 2 miles to the car, using my better foot (left foot was support) and right foot using just the bottom 1/2 of the foot. So, this podiatrist at mills spent about 5 minutes with me. I bought some shoes for him to examine. And he said he would send me to PT and sold me an OTC insert. I asked him before leaving, "Well aren't you going to do a gait analysis" and he said no, that the PT will do so. Went to Mills for probably 7 of the 10 sessions. The PT could not figure out what 's up with my foot /feet. He had me do some exercises. He had me go on a treadmill. He worked on my ankle with cupping. He had to give my ankle "stimuli"...when he instructed me to raise my ankle I couldn't do it in isolation. My whole body moves. He had to lift it up a few times, then my ankle was able to imitate it. In a different session, the "cupping" for a few minutes was the stimulus that allowed the ankle/foot to fire up. This PT felt disappointed he could not help me and didn't want to waste any more of my money with the remaining sessions, which he felt would not achieve much. Sent me back to the podiatrist and at the appt w/ the podiatrist, he shrugged and said: "find an osteopath or physiatrist". I asked if he could recommend one and he said "google it"....so after all these years, I haven't had luck with dealing with this..so I shrugged and continued my life w/ my 2-4 x monthly massage therapist while continuing to put this feet issue on hold. Dr. Blake's comment: I am so sorry for such poor medicine. The therapist just needed direction, but no excuse from my profession. We are supposed to give the direction. The crucial point you made is not being able to do a heel raise. If you can not do that, you can not walk well. Having a physiatrist or neurologist do a nerve conduction study will tell you if it is neurological or if it can come back. Also, what have you found in shoe gear to help yourself? Any correlation to less pain with a slight heel versus flat shoes? Fast forward 1 year and the feet is just KILLING ME. I decided to try ONE MORE TIME. Bear in mind I have little energy and my chronic feet and back problems are killing me physically and more so, emotionally. Besides the massage therapy and Chinese chiro work I do, I am pretty busy running around to yoga classes, heat therapy (sauna & spa for my back as suggested by the massage therapist) so it's not like I'm sitting around whining and feeling sorry for me. I have gone to yoga for 2-3 years, then tried machine pilates after pilates was too unrealistic w/ the back and no core, classes @ the gym (which killed my feet---ANY type of movvement, whether dance, exercise based aerobics, even low impact step class was EXCRUCIATINGLY painful on my feet, whether I was barefoot or with good shoes running/walkign shoes, shoes with the OTC inserts (happy feet), inserts I bought in asia more to the "asian" foot, the original custom made insole from 6-7 years (?) ago. The massage therapist asked me to STOP ALL exercises and walk on sand. I cannot bear to think that for the rest of my life I will have a life sentence for physical activities. I am now looking into belly dance and hula dance (for the hip movements for the lower back). Dr. Blake's comment: Even though this is a terrible situation, I just love your spirit!! We need you to focus on what has helped you somewhat. We need to put this together to help you. So, if you write back, list the 5 things besides massage therapy that has helped. There must be parts of Pilates you can do, parts of yoga, etc. There seems to be a mechanical source of some of your pain and can be addressed hopefully with a more thoughtful approach to orthotic devices, but what are we doing for the nerve pain. This takes an approach to the Neuropathic pain, not mechanical pain or inflammatory pain. What have you tried? So recently, I saw a podiatrist who insisted on XRAYS, full spine & right foot. 4 degenerative discs in the lower back (possibly from being rear ended 3 years ago . LAdy hit me so hard my car hit the person in front). From what the yoga instructors tell me, my pelvis is shifted. Didn't pursue the driver as I was naive and didn't see any mds and didn't realize it could have compounded cause more back issues since I already had pre-existing back issues and I was plain naive. When I realized I should have sought treatment right after the incident the time limit surpassed. foot contusion, peroneal tendonitis, and exterior tibial tendonitis. how do we know if the original custom-made orthotic made 7+ years (?) ago is correcting/fixing the problem she's diagnosing? my recollection isn't' 100% but the podiatrist who made it just mentioned I had flat feet, but current podiatrist and shoe sales guy said I don't. So how do I know by wearing the custom-made insoles will help me? Further, I wore them in an exercise class and it hurt like hell. Dr. Blake's comment: First of all, the reason I asked the above question on whether they made you feel more stable, is that is what custom orthotic devices are about. They increase stability by decreasing pronation, decreasing supination, giving you a broader base of support, etc. 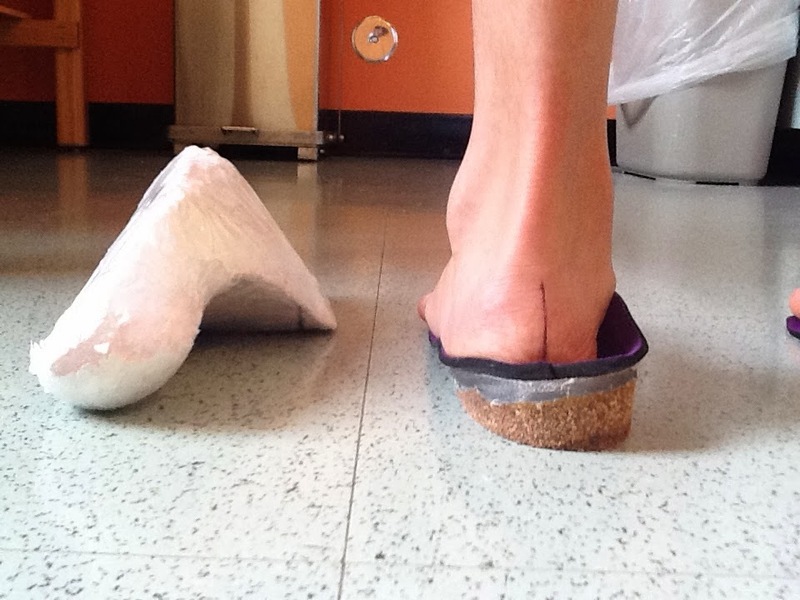 Just because you got orthotics does not mean that they were designed for the right function. It takes work to figure that out, and they have to be comfortable also. Typically I can always make old orthotics comfortable by some adjustment, but getting them functioning well in some ways depends on how they were initially made (what were they trying to do). I was able to raise many examples and give a lot of good history for this podiatrist in my 1st visit, b/c having taken all the yoga, pilates, and other exercises I've tried the past 3-4 years gave me very concrete examples of what my body was/wasn't doing in classes. Please advise. Do you think you could help? Do you think getting a new set of orthotics (now that I'm 25-30 lbs heavier) would help? I wished I followed up after getting the first orthotics, but I didn't know what I do today. Living in excruciating pain. Would be very grateful to live and manage my pain. Here is testimony from a patient suffering from chronic plantar fasciitis treated with MLS Laser by Dr. Jenny Sanders here in San Francisco. This is another tool to treat this sometimes frustrating injury. I personally do not offer it, but I know it is fairly widespread in use. I trust that someone of Dr. Sanders expertise would know when to use it and when not to. I am so excited to present the Jen Review on Vitamin D. Any time an athlete presents with a bone injury there must at least by a discussion into bone health. You injure your bones running long distance, makes sense, but could have it been avoided and more fractures prevented by checking bone health. 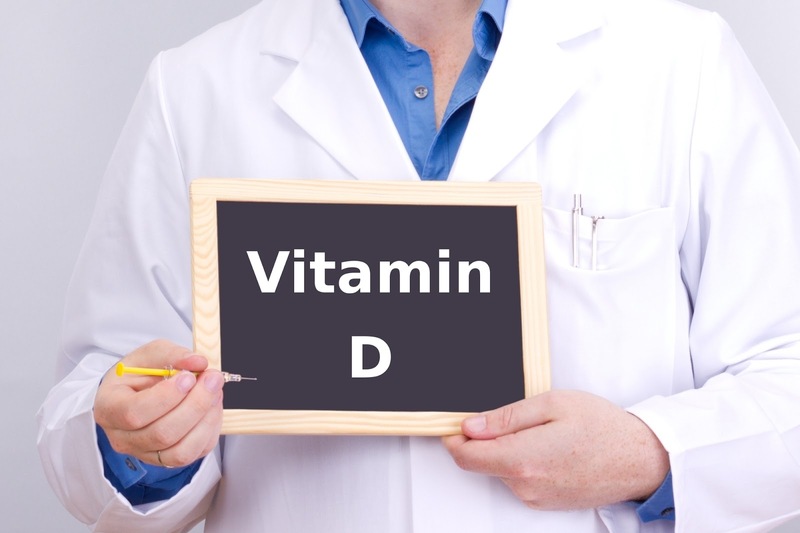 There are so many factors involved in bone health, but Vitamin D is a big one. And, Vitamin D deficiency is rampant in our society covered with sunblock and long winter months or just long periods of never getting outside except on vacation. This article is a thorough understanding of all aspects of Vitamin D. Jen has done a wonderful job presenting us with the great knowledge base to prevent further bone injuries. Thank you, Jen. I have been wearing the boot a few days now...I have been experiencing some pretty intense waves of pain in my heel (like a burning ache) when I'm just sitting with the boot on. It's pretty alarming...is this a normal "adjustment" to the boot or is this a bad sign? Is this bursitis or a reaction to the boot? Can I take the boot off when I'm just sitting around? Sorry to have more questions! 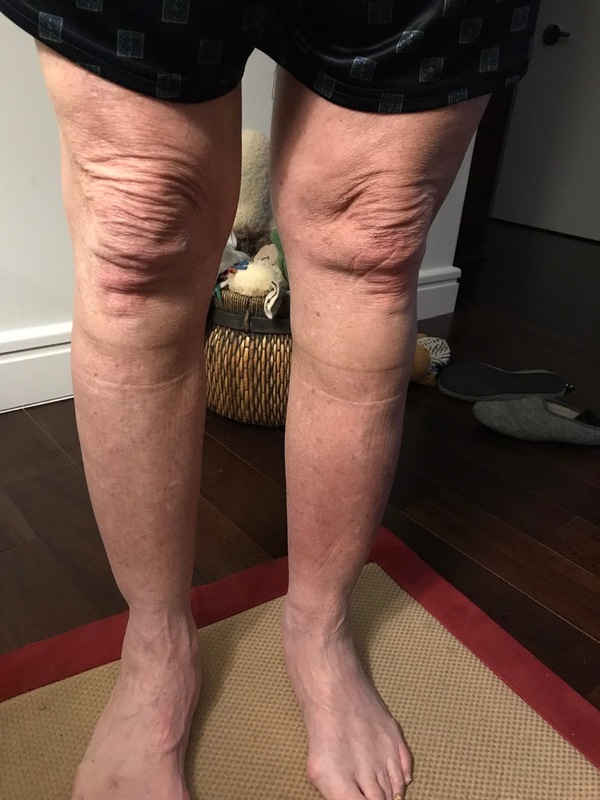 My patient reminded me that after struggling for several years, and getting somewhat better with my orthotics and stretching and taping and icing program, that the final cure was the deep tissue massage she got in the calf and even front of her lower leg. This is a recurring pattern for my patients and PT or massage therapy can be very important for some patients to finally cure their plantar fasciitis by working out the tension in the calf and leg muscles and fascia. First, thank you for the blog and book—both have been extremely helpful as I have been dealing with a frustrating sesamoid. I am writing to get your opinion on returning to activity with this injury. I have gotten to the point where I no longer have pain doing everyday activities, so I decided to start a walk/run program in December. I can now jog for a total of 12 minutes with no pain. (Yay!) In January, I decided to see what climbing feels like. After a little trial and error, I have found that with certain shoes, I will have no pain after 2 pitches. But I definitely have pain if I do more climbing or if I wear shoes that are too soft. Multi-pitch climbing. 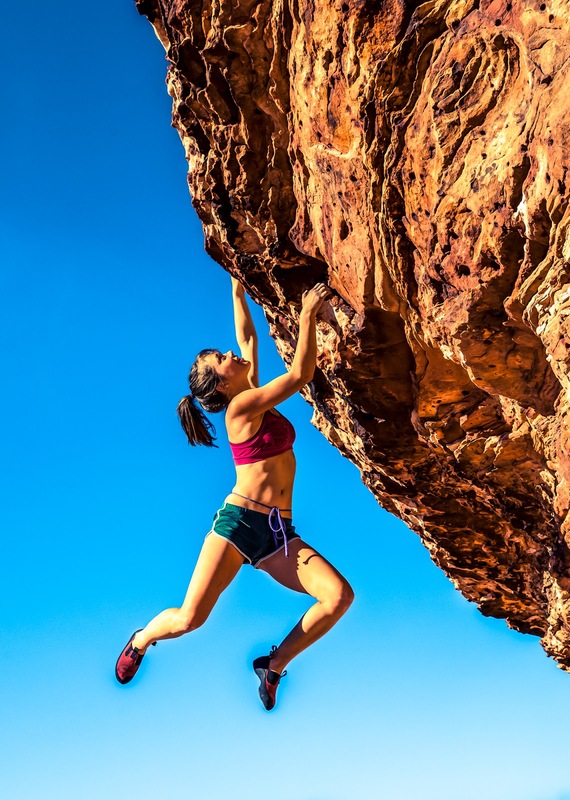 Multi-pitch climbing is the ascent of climbing routes with one or more stops at a belay station. Each section of a climb between stops at belay stations is called a pitch. The leader ascends the pitch, placing gear and stopping to anchor themselves to the belay station. So based on my levels of pain, I was feeling like I was making progress. Recently I got new X-rays and they showed no change/improvement. My doctor doesn’t think I should be running or climbing at all for another 3 months if I want to give this thing a chance to heal. And if it doesn’t heal after three months, then I need to think about whether I can manage/tolerate the pain or if I want to have surgery. Dr. Blake's comment: I am so pleased what you are doing. You are doing everything right. Creating the 0-2 pain level is all you need for healing. And you need to stimulate the tissue for strength. A runner has to run and a rock climber has to climb. It is a basic part of sports rehab having the athlete do sports specific activities as long as they keep the pain level between 0-2 consistently. The xray will look bad for a while, even when internally it is healing. An MRI will show bone edema-indicating injury repair for long after the fracture has healed. How you feel is more important at this point because you are through the Immobilization Phase of Rehab, past the Restrengthening Phase, and into the Return to Activity Phase. Bone Stim for 9 months total. Is it really necessary to give up the small amounts of climbing and running that I have recently added to my life? No, unless there is more than just comparison x-rays, having another MRI 6 months after the first is great. Or, getting a CT scan to look for AVN signs now. If we have no other info, I say keep listening to your body and gradually build up what you are doing. Do you know anything about using shockwave therapy to treat sesamoid fractures (that was another suggestion recently made to me)? Sure, it is to cause microfractures in the bone to take a chronic healer and make it acute. You would then go back into a boot for 3 months and start the process all over. That does not make sense now. It also makes no sense to me that patients are getting this powerful treatment like a physical therapy session with no changes in activity, restrictions, etc. How and when do I go about making decisions about surgery vs. just dealing with it? To me, surgery makes more sense than dealing with it. That can cause a breakdown in the joint, and compensatory pain. The surgery is typically very successful and then you have to protect the other sesamoid at high-risk activities with your orthotics. Not too big of a deal for most. But, in general, you want to save it if you can, common sense. If you were in my office tomorrow, and we had no cost restrictions, I would get a CT scan and repeat the MRI six months after the first. Then we would have a wonderful idea what the next year looks like. At this stage, climbing is really the only thing that gives me pain—but it is also my favorite thing to do. I seem to keep meeting other climbers with sesamoid problems—do you have any experience working with climbers? If so, any tips for returning to my favorite sport? Dr. Blake's comment: First of all, stay in rigid shoes that accommodate your orthotics and spend this year working on technique challenges that use mainly your upper body. Let your big toe have a break, so it is able to completely heal. Drills, like seen in this video with Daniel Woods, can be modified to avoid toe bending of the involved side. We are only talking about a short time in your long life. This place was slightly cheaper per pair than the SF Dancewear on Mission St. No tax (to CA) and yesterday, free shipping on orders over $40, not $65! The San Francisco Dancewear, 659 Mission St. let me try them on. I bought 2 pairs from them. Amazon price was $19.95, plus tax. They have many other kinds of footwear/supports that might work for other needs, too. You can get a catalog from this website. Why do partial tears hurt more than complete tears? Thank you so much. It is so frustrating to have doctor after doctor call this "plantar fasciitis"...the podiatrist yesterday told me that "if there is a tear, I don't think that's what's bothering you because the surgery to fix plantar fasciitis is actually cutting the plantar fascia." While that may be true, there's also a pretty extensive recovery period for that! May I ask what your opinion is on EPAT and if that would speed the healing process? Also what type of exercise would be considered "safe"? Swimming? Biking? Dr. Blake's comment: This patient is struggling with a partial tear of the plantar fascia. I have only found them to heal with 4-6 months of no stretching and no tension allowed on the plantar fascia (with a removable boot or hike and bike shoe to not allow bending of the big toe joint). The doctor's comment revealed a lack of understanding (sorry!!) of why partial tears hurt more than complete tears. This is so true, and better explained, with the Achilles tendon. When someone completely tears the Achilles, or an ankle ligament, the immediate pain is severe, but then they have relatively no pain. They only have the instability caused by the injured structure not doing its job because it is torn. With a partial tear, the ligament, or tendon, is trying to work when stressed, but the weakest link in the chain is the tear, and that will hurt when stressed. A 10% tear of the Achilles can hurt much more than a complete tear of the Achilles. I have seen patients who have torn their plantar fascia completely, completely recover. But I have seen patients who have their plantar fascia cut in surgery for chronic plantar fascia, who are left with a flat foot or other foot issues. My recommendation is to rest it the next 4-6 using the plantar fascia tear protocol in this blog and be done with this injury. This is a patient I have been helping, along with her imaging. The plantar fascia has a partial tear and the inflammation since she is not addressing this properly is intense. I had her email me a full story, plus she gave me other feedback from her doc's visit today. Here are the images of the partial tear and intense inflammation. I am a distance runner, and around March of last winter (2017) I began to experience pain in my left heel. Unlike typical plantar fasciitis which usually presents almost out of thin air as pain in the morning one day, this came on during a run. As symptoms gradually worsened, I decided to take time off. I knew the body's inflammatory response usually lasts a few weeks, so I refrained from running for about 2 1/2 weeks. The pain didn't get worse, and it didn't get better. It was always the worst after getting up in the morning, stepping out of my car, and getting up from my desk. I figured, if the pain wasn't going to improve with rest, I might as well run! I am also a huge believer in Mind-Body Syndrome (TMS), and I was 95% convinced this was the cause of my heel pain, and that I could continue to run and eventually the symptoms would dissipate. Running actually wasn't painful, but afterward (especially following long runs), the pain was pretty intense. It took a few months, but as crazy as it sounds, the pain did go away. I considered myself completely healed and didn't even remotely fathom the pain could or would return. Dr. Blake's comment: This could have the initial tearing of the plantar fascia, so small a tear, that it would heal and re-tear no matter what you did. I had a runner in several years ago that this syndrome went on to some degree for 10 years. We finally placed him in a removable boot for 3 months, with no achilles or plantar fascial stretching, and the other 3 months of keeping the pain level between 0-2, and he allowed the plantar fascia to get stronger intrinsically, and he has not had problems for 2 years. Knock on wood!!! Fast forward to October, I was happily plugging away training for the Philly Marathon. I had just gotten word that my qualifying time from 2016 got me in to Boston 2018. I was super excited. During a 15 mile training run at an extremely hilly course in Valley Forge Park, the heel pain returned quite unexpectedly. I was absolutely convinced it was in my head. I had run through this "plantar fasciitis" before successfully, and I was about 3/4 of the way through my training plan, and I really did NOT want to shut it down and rest...so I continued to train. Only the pain did not get better, it continued to get worse, to the point where every single step of running was painful. I must have started to compensate in some way in anticipation of the pain, because I ended up with a calf injury. Dr. Blake's comment: First of all, my son Chris went to Cabrini in Wayne, PA, and I love Valley Forge Park. Secondly, this time you increased the tearing, which had never gotten perfect in the first go around in March. I am linking to my blog post on Good vs Bad Pain that should be your bible from now on. My calf bothered me running, but I could power through...afterward, however, I could barely walk. At this point I decided the situation had gotten dire enough that it warranted a visit to my PCP. He ended up recommending x-rays and referring me to a podiatrist. X-rays revealed a heel spur (not a surprise), but not a stress fracture. At this point in time, my main (and most painful) concern was my calf (I had pretty much gotten used to the heel pain which was admittedly pretty bad). The podiatrist advised the standard protocol for plantar fasciitis (rolling with an iced water bottle, stretching, prescription anti-inflammatories). I wasn't keen on the idea of an injection, so he said we could follow up in a week and do the injection then if necessary. I asked if I could continue to run, and he said yes. That plan failed miserably. Despite stretching, rolling, icing, heating and doing everything imaginable to baby my calf, after a 17 mile long run I couldn't walk for two days. 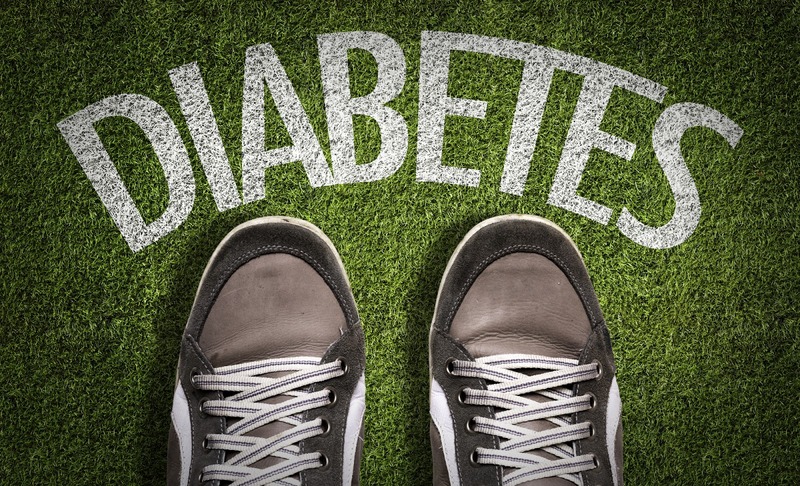 The podiatrist then recommended a venous duplex to rule out a blood clot. He was also suspicious of exercise-induced compartment syndrome. The venous duplex (was expensive) and negative. At this juncture, I knew there was nothing left to do but shut it down and rest so that I would be healthy in time to start training for Boston (which would begin at the end of December). I rested for about a month and a half. My pain subsided. Dr. Blake's comment: I must say that there is a lot more to healing than having the pain go away. The pain is inflammatory usually and can improve, but the tissue may not be close to healing. You can not be seeing a sports doc since your advice is questionable. What that diplomatic?? Pain like this in your heal is from either 3 things: pinched nerve (which can give you the calf pain also), tearing of the plantar fascia (which your later MRI showed), and stress fracture of the heel bone (which your MRI ruled out). When I started running again, I did so by gradually building up mileage. I tried to play it smart, but while my calf pain seemed 100% cured (I'm going to assume it was a strain), it didn't take long for the heel pain to return. 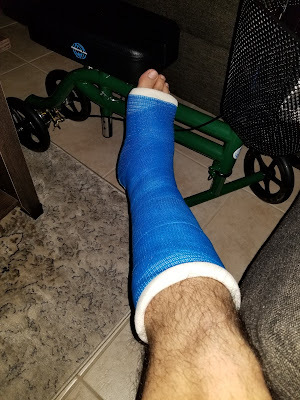 I wore a night splint, I visited my chiropractor for ART, I went to physical therapy where they did a variation of Graston, heat and ultrasound therapy, and stretching...and while the pain generally improved, it still persisted. I discovered that rolling my foot on a little wooden roller for plantar fasciitis was the one thing that actually provided relief, but rolling over my heel the pain was so intense that it would shoot up my entire body. And while stretching was universally recommended to me by every doctor across the board, it always seemed to make things worse. Dr. Blake's comment: This is one of the reasons why it is important to get an MRI. Plantar fasciitis improves with stretching, ART, Graston, night splints, whereas plantar fascial tearing is only made worse by these treatments. Historically, you told the world that this was not plantar fasciitis since it came on suddenly in a run, not gradually over time. And, the pain started to have different patterns than it did before; suddenly it was worse in the evenings, some days the pain would ebb and flow during runs, and some days it would dissipate after a few miles then come back toward the end, sometimes it wouldn't bother me after a 5 miler and other times it would. I have discovered that while there are time that it may not bother me walking, my entire heel is consistently extremely sore to the touch. Dr. Blake's comment: These are complex. You have the orthopedic injury that needs a solid treatment plan to heal. You can have the up and down of inflammatory pain which you are experiencing which is influenced by what you ate, how hydrated you are, what you did 1-2 days ago, how much alcohol you consumed, etc etc. And then there is neuropathic pain based on whether you are limping or the injury is next to a nerve etc. I finally decided it was time for answers, and went to a new podiatrist to get a referral for an MRI. The report stated that the findings were "consistent with plantar fasciitis. No plantar fascia tear. Minimal bone marrow edema in the calcaneus about the plantar fascia attachment may reflect reactive marrow edema, stress reaction, or a combination thereof." I was disappointed only because I was hoping to learn something from the MRI other than "it's plantar fasciitis." Since I had tried everything in the book to treat it already (rest, ice, heat, NSAIDs, stretching, night splint, chiro, physical therapy, etc.). Since Boston very well may be a once-in-a-lifetime opportunity (and it was extra special to make it in this year since I qualified for but was cut from the 2017 race), I am hoping against hope there is something I can do now to make it there in April. Dr. Blake's comment: I am sorry about Boston. You need to once and for all heal the tear that was seen on the imaging. Sorry the MRI report did not report the tear, but it is there. You need to go into the plantar fascial tear protocol. These things heal, but we need them to get strong also so that it won't tear again. The entire process is typically 6 months. So, you need a goal of running for 2019. We need to get this healed, then 3 months of base running (no goals). Then, you will be ready to start training for something special!! Since I hadn't yet answered the above email, this one also came. I apologize for bugging you again. I had an appointment with a new podiatrist today and I'm a little upset. She only very quickly looked at my MRI images (even though I showed her your site as well) is recommending 2 weeks in a boot + physical therapy (I have already done physical therapy, but it was focused mostly on the foot whereas she wants to send me somewhere that would address the "glute weakness" that she thinks is the root of the problem). She is not at all concerned about the tear and is calling it "plantar fasciitis." I just really find it hard to believe this chronic issue I've had for a year now will get fixed in 2 weeks with physical therapy. I asked about an injection for the bursitis and she said she is not a fan of them (generally speaking I am not either, but I was under the impression an injection for bursitis would be in a different location from an injection for general plantar fasciitis?) I'm just wondering what your recommendation, in this case, might be?